Sidney Slon/Staff Photographer Junior guard Karlee Krchnavi tallied 13 points, eight boards and three blocks to help the Bearcats defeat Fairleigh Dickinson at home. After a hot start, the Binghamton women’s basketball team was struggling to create open shots against Fairleigh Dickinson. With the Knights (2-4) down by two, a steal by FDU senior guard Peniel M’Bikata put her ahead of all defenders and in great position to tie the game in the third quarter. However, junior guard Karlee Krchnavi chased down M’Bikata’s shot from behind, punching the ball to the Binghamton pep band. The momentum-swinging play helped propel the Bearcats (5-3) to a 73-54 victory over the Knights. Krchnavi dominated on both ends of the court, recording career-highs of 13 points and three blocks. Both teams began the game on fire offensively, combining for 40 points and seven made 3-pointers in the opening period. BU struggled to get stops defensively because of M’Bikata, who recorded eight points without missing a shot in the first quarter. 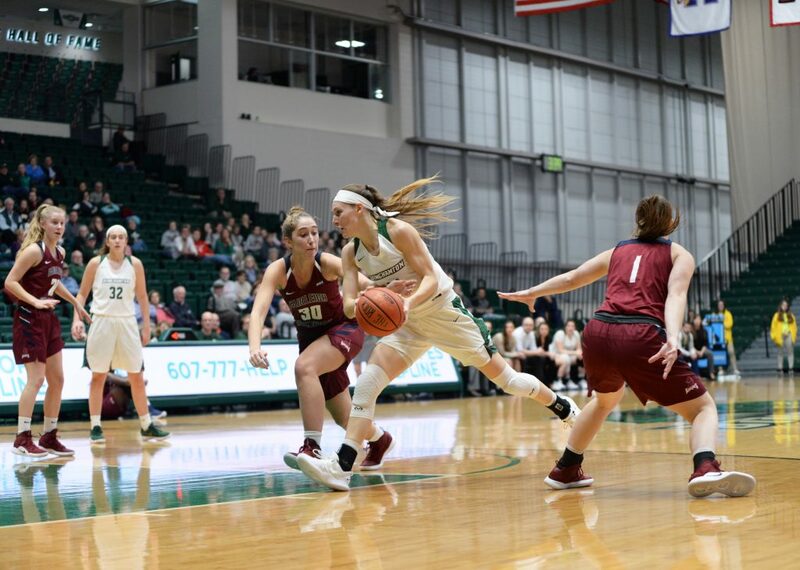 Featuring great pace and intensity, the quarter was capped off with a buzzer-beating jumper by sophomore guard Lizzy Spindler, who proceeded to let out a vociferous scream of satisfaction as Binghamton took a 23-17 lead. Each squad made effective defensive adjustments in the second quarter, cooling off from 3-point range as a result. FDU made zero shots from deep in the period but was able to run the Bearcats off the 3-point line and force tough shots inside the arc, as BU shot a lowly 2-for-10 on 2-pointers in the second quarter. The teams combined for only 23 points in the quarter after an explosive start to the game. Entering the game in a groove offensively, senior forward Rebecca Carmody struggled to get open in the first half, recording only four points on 2-of-5 shooting. Binghamton failed to attempt a free throw in the first half and entered the halftime break up by three. The third quarter opened with the same drudging pace with which the first half ended. With both FDU and the Bearcats playing tight, the game remained winnable for the Knights. Krchnavi’s chase-down block came with just over seven minutes remaining in the quarter, and the Bearcats seized momentum from that point forward. Leading by two at the time of the block, BU outscored Fairleigh Dickinson by 17 in the game’s remaining minutes to earn the victory. Four players scored in double figures for the Bearcats as the team’s off-ball movement produced many open shots off assists. In the second half, Carmody returned to the form she has shown all season. Freeing herself on many cuts to the basket, the senior poured in 13 of her game-high 17 points in the final two quarters. Sophomore forward Olivia Ramil was one of Carmody’s benefactors, recording five assists in the win. As one of the Bearcats’ tallest rotation players, Ramil has now averaged 4.5 assists over Binghamton’s past four games and has emerged as one of the team’s main facilitators despite playing a position not known for its passing. Junior guard Carly Boland and Spindler each played well as BU’s starting backcourt, filling in admirably for junior guard Kai Moon. Boland chipped in 12 points, four rebounds, five assists and two blocks, while Spindler contributed 13 points and four assists. Binghamton recorded 20 dimes on 30 made field goals, exemplifying the team’s crafty ball movement. Moon missed her second consecutive game with an injury and was sporting a walking boot on the bench. After the game, Shapiro Ord provided some semblance of a time frame for Moon’s return. After going 3-1 on its home stand, Binghamton will return to action on the road against Niagara on Wednesday. Tipoff from the Gallagher Center in Niagara Falls, New York is scheduled for 7 p.m.